This route is the perfect excuse to visit some old country estates, typical of the mountains. We start leaving Las Piletas, situated at a junction from the national road Almería - Guadix, going up to a beautiful valley. 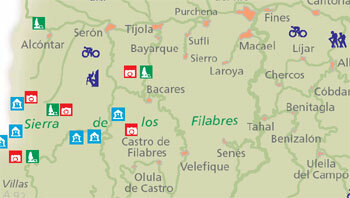 The track leads to Gilma country estate, and farther to Las Rojas situated along La Rambla de Gilma valley where there are old remains and hidden country houses behind each hillock. Walking on the north, we shall arrive at a track which leads to the Astronomic Observatory.